Jim Daly, president and CEO of Focus on the Family, doesn’t claim to know the “whys,” and he doesn’t ever promise that you will either. But he’s had his own share of harrowing experiences, and through the pain, he’s accepted a transformational truth: God uses struggles to strengthen your faith. 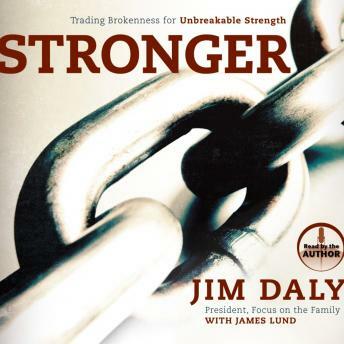 With warmth and candor, Daly shares anecdotes from his childhood, adult life, and international travels for Focus on the Family. He tells engaging, real-life stories that, although seemingly tragic, demonstrate the constancy of God’s grace in the midst of disillusionment. Without describing a step-by-step program, he imparts practical biblical principles that demonstrate how to draw on the only source of enduring, powerful strength. Stronger shows us that we can find strength in our weakness and that we can always continue to grow in character and maturity. Through Christ, our brokenness is redeemed. Through Christ, we become stronger.